Javier Bardem was the year's Best Supporting Actor Academy Award winner for his performance as a merciless hired killer in Joel and Ethan Coen's thriller No Country for Old Men. 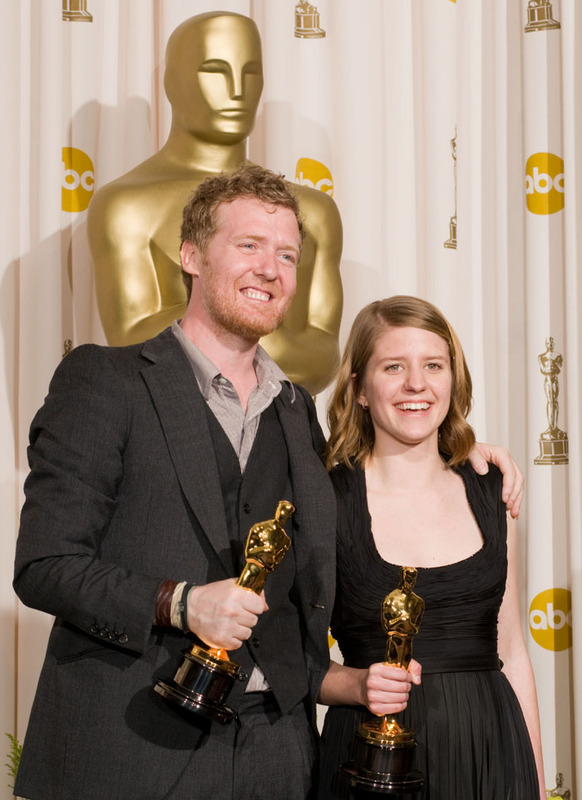 The 2008 Oscar ceremony took place on Feb. 24, '08, at the Kodak Theatre in Hollywood. Bardem had been previously been nominated in the Best Actor category for Julian Schnabel's Before Night Falls (2000), in which he plays Cuban poet Reinaldo Arenas. 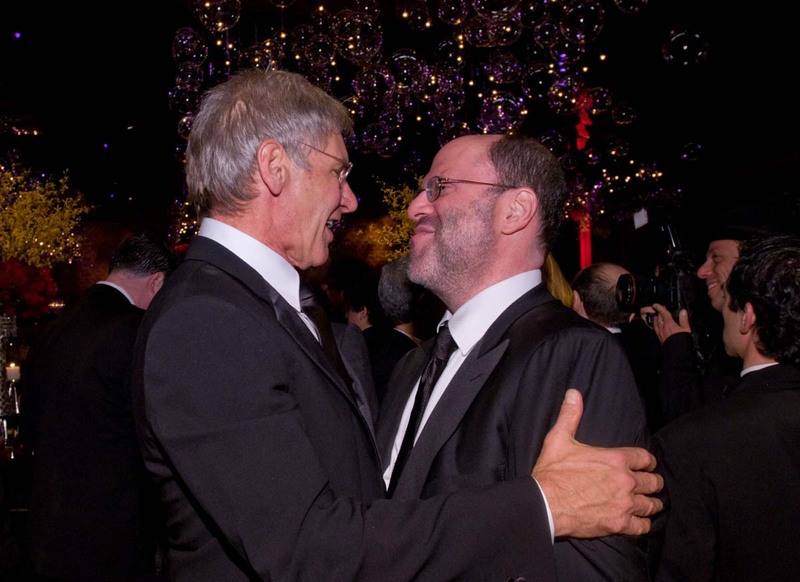 He lost to Russell Crowe in Ridley Scott's Gladiator. Pedro Almodóvar's comedy High Heels (1990), in which he has a supporting role. Victoria Abril and Marisa Paredes star. Pedro Almodóvar's psychological drama Live Flesh (1997), with Francesca Nori and Penélope Cruz. Bigas Luna's risqué comedy Jamon Jamon (1992), with Anna Galiena, Penélope Cruz, Jordi Mollà, and veteran Stefania Sandrelli (Divorce Italian Style). Manuel Gómez Pereira's saucy comedies Boca a Boca (1995), with Aitana Sánchez-Gijón, and Between Your Legs (1999), with Victoria Abril. Gerardo Vera's old-fashioned – and paradoxically, quite daring – gay romantic drama Second Skin (1999), with Jordi Mollà and Ariadna Gil. Fernando León de Aranoa's labor drama Mondays in the Sun (2002), with Luis Tosar. Alejandro Amenábar's Best Foreign Language Film Oscar-winning right-to-die drama The Sea Inside (2004), in which Bardem plays a tetraplegic befriended by Belén Rueda and Lola Dueñas. Michael Mann's Collateral (2004), with Tom Cruise and Jamie Foxx, and in which Bardem has what amounts to a cameo. Milos Forman's Goya's Ghosts (2006), with Natalie Portman and Stellan Skarsgård. Mike Newell's Love in the Time of Cholera (2007), with Benjamin Bratt and Giovanna Mezzogiorno. Javier Bardem Oscar photo: Matt Petit / © A.M.P.A.S. 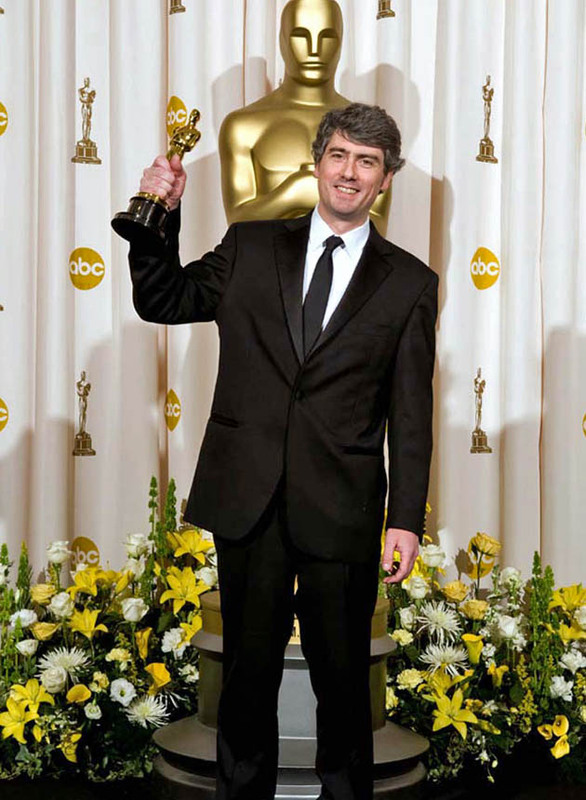 Below are Oscar 2008 pictures of composer Dario Marianelli, screenwriter Diablo Cody, and others. Photos: Todd Wawrychuk / © A.M.P.A.S. 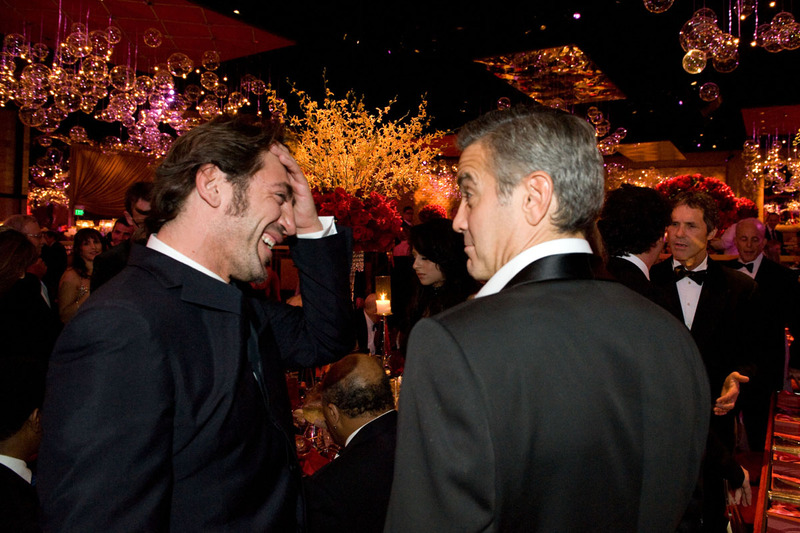 (Bardem & Clooney). 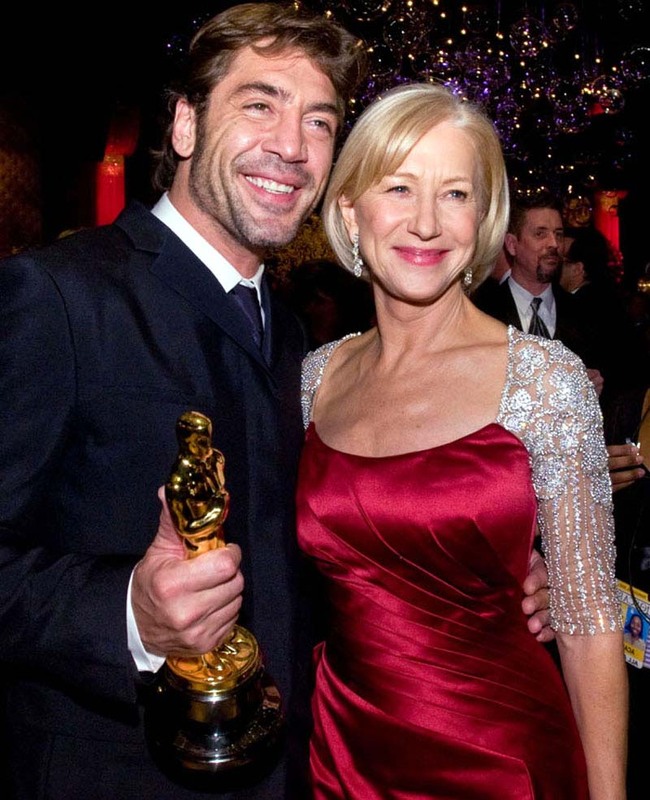 Helen Mirren & Javier Bardem photo: Darren Decker / © A.M.P.A.S. Photos: Matt Petit (Asano), Michael Yada (Ryan). All photos: © A.M.P.A.S. 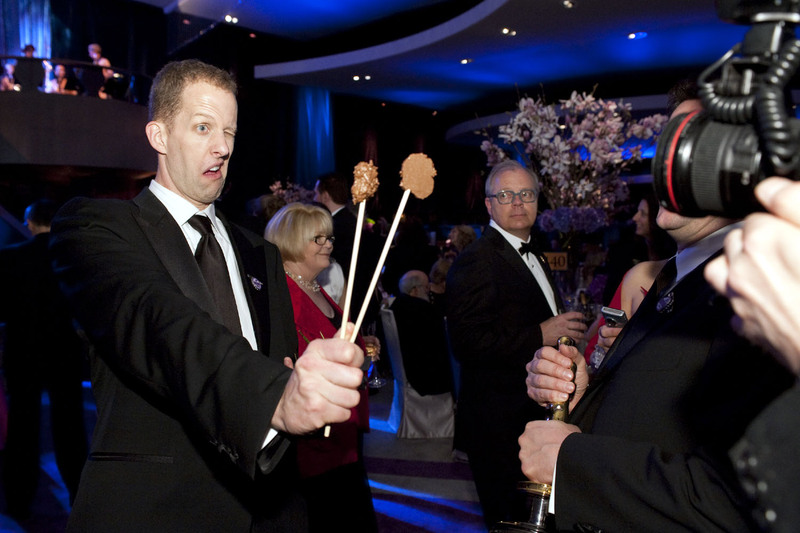 Pete Docter Photo: Matt Petit / © A.M.P.A.S. 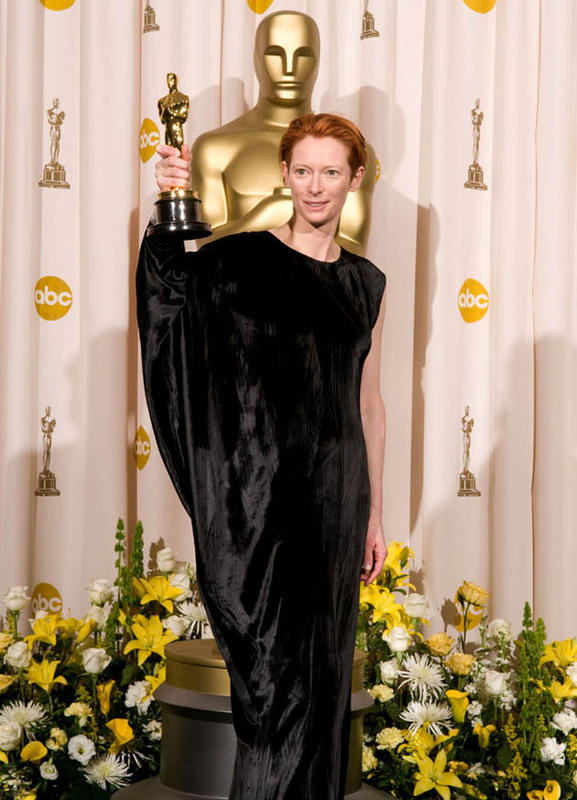 Tilda Swinton, whose unusual film career dates back to the mid-1980s, was the Best Supporting Actress Academy Award winner at the 2008 Oscar ceremony held on Feb. 24 at the Kodak Theatre in the Los Angeles district of Hollywood. Swinton won for her performance in Tony Gilroy's Michael Clayton, a socially conscious drama co-starring George Clooney and Tom Wilkinson. That was Swinton's first Oscar nomination. Tilda Swinton film credits range from the subversive to the mundane, from the outlandishly independent to the mind-numbingly commercial. But in all fairness, Swinton's movie career has been (much) more daring than most. Below are a few samples. Derek Jarman's Caravaggio (1986), with Nigel Terry in the title role and Sean Bean as Ranuccio. Jarman's experimental The Last of England (1987), narrated by Nigel Terry. Jarman's dialogue-less War Requiem (1989), with Nigel Terry, Sean Bean, Nathaniel Parker, and Laurence Olivier in his last film role. Jarman's audience-unfriendly Edward II (1991), with Steven Waddington in the title role. Sally Potter's gender-bending Orlando (1992), with Swinton in the title role and Quentin Crisp as Queen Elizabeth I.
Derek Jarman's Wittgenstein (1993), with Karl Johnson as Ludwig Wittgenstein, Michael Gough as Bertrand Russell, and Tilda Swinton as Lady Ottoline Morrell. Jarman's final film before succumbing to AIDS complications, Blue (1993), featuring a blue screen and narration by Jarman himself, Swinton, Nigel Terry, and John Quentin. A crime drama in which she becomes involved with gay blackmailer Goran Visnjic. Dir. : Scott McGehee. David Siegel. Cast: Tilda Swinton. Goran Visnjic. Jonathan Tucker. Peter Donat. Josh Lucas. An audience-friendly remake of Alejandro Amenábar's Open Your Eyes. Cast: Tom Cruise. Cameron Diaz. Penélope Cruz. Tilda Swinton. A highly unusual – and ultimately frustrating – big-studio release (Columbia Pictures). Cast: Nicolas Cage. Meryl Streep. Chris Cooper. Tilda Swinton. A sort of male version of Julien Duvivier's Un carnet de bal, toplining Bill Murray and the women in his past. Cast: Bill Murray. Jessica Lange. Chloë Sevigny. Julie Delpy. Tilda Swinton. Sharon Stone. The big-budget fantasy The Chronicles of Narnia: The Lion, the Witch and the Wardrobe (2005). Cast: William Moseley. Georgie Henley. James McAvoy. Skandar Keynes. Jim Broadbent. Tilda Swinton as the White Witch. The low-budget psychological/crime drama Stephanie Daley (2006). Cast: Amber Tamblyn. Melissa Leo. Tilda Swinton. Vincent Piazza. Timothy Hutton. Constance Wu. Andrew Adamson's The Chronicles of Narnia: Prince Caspian, with Swinton once again as the White Witch. Joel and Ethan Coen's Burn After Reading, starring George Clooney, Brad Pitt, and Frances McDormand. David Fincher's The Curious Case of Benjamin Button, with Brad Pitt, Cate Blanchett, and Taraji P. Henson. Tilda Swinton photo: Matt Petit / © A.M.P.A.S. 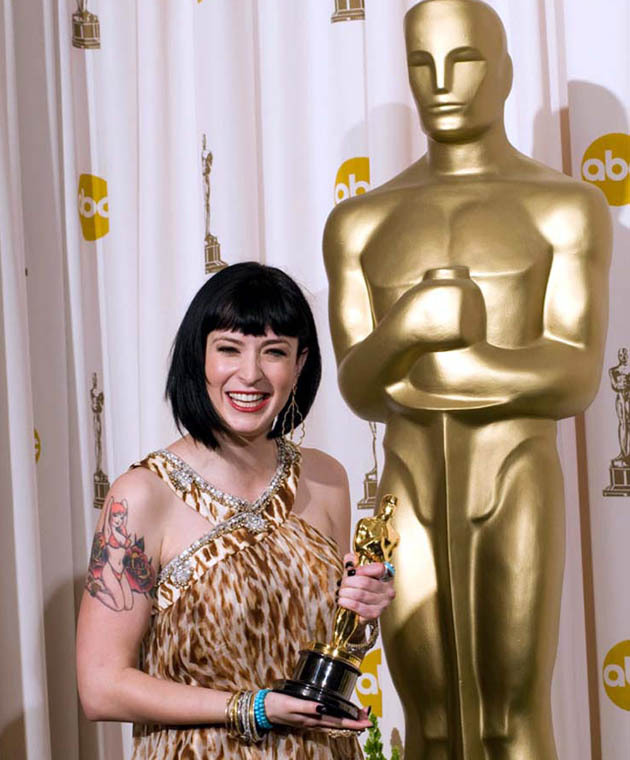 Below are a few more Oscar 2008 images featuring the likes of Best Actor winner Daniel Day-Lewis, Brad Bird, and presenters Steve Carell, Anne Hathaway, and Owen Wilson. Brad Bird: Oscar winner in the Best Animated Feature Film category for 'Ratatouille,' with presenters Steve Carell and Anne Hathaway. 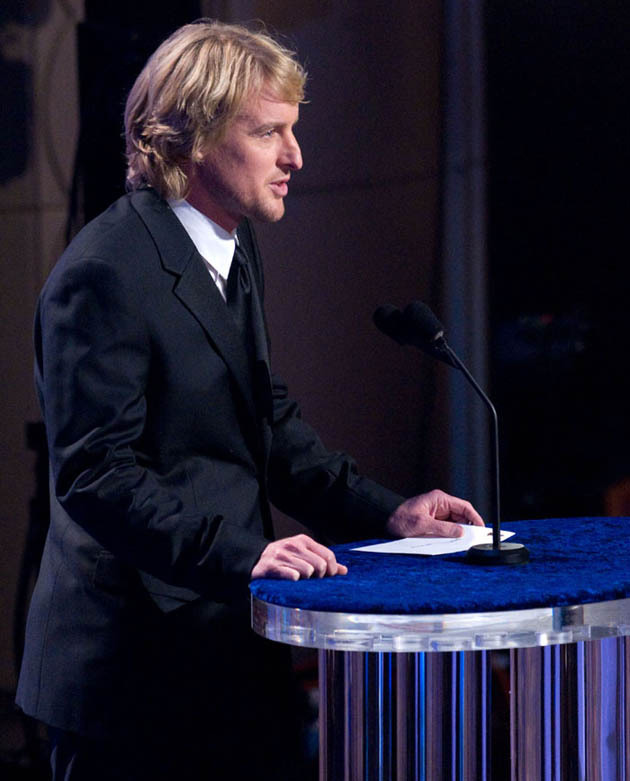 Owen Wilson: Presenter at the 2008 Academy Awards. Harrison Ford and Calista Flockhart arrive at the 2008 Academy Awards ceremony. Born in Chicago in July 1942, Ford has been nominated for only one Best Actor Academy Award: Peter Weir's crime drama Witness (1985). 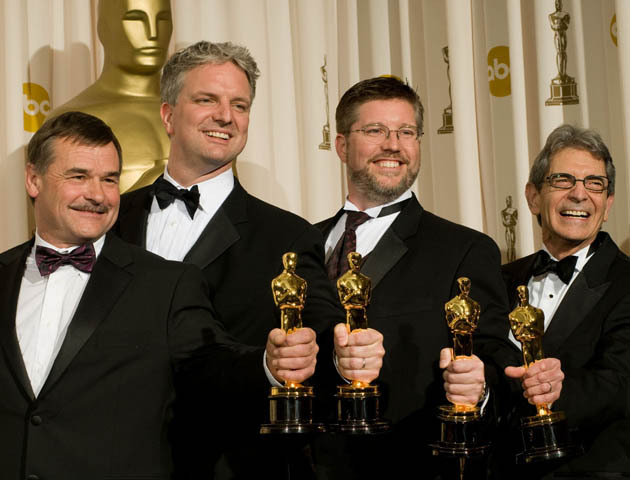 Several Harrison Ford movies have received Best Picture Oscar nominations. Among those are George Lucas' Star Wars (1977), Steven Spielberg's Raiders of the Lost Ark (1981), the aforementioned Witness, Mike Nichols' Working Girl (1988), and Andrew Davies' The Fugitive (1993). In addition to two Francis Ford Coppola films in which Ford has supporting roles: The Conversation (1974) and Apocalypse Now (1979). Other Harrison Ford movies include Steven Spielberg's Indiana Jones and the Temple of Doom (1984), Roman Polanski's Frantic (1985), Phillip Noyce's Patriot Games (1992) and Clear and Present Danger (1994), Sydney Pollack's Sabrina (1995), and Spielberg's upcoming Indiana Jones and the Kingdom of the Crystal Skull (2008). Harrison Ford and Calista Flockhart have been together for a few years. Flockhart is best known for the television series Ally McBeal. She also made headlines a couple of years ago after saying she had suffered from a type of eating disorder while working on Ally McBeal. Rumors abounded at the time that Flockhart was suffering from anorexia. Flockhart has appeared in only a handful of movies, among them The Birdcage, Telling Lies in America, A Midsummer Night's Dream, and The Last Shot. Harrison Ford and Calista Flockhart photo: Richard Harbaugh / © A.M.P.A.S. Photos: Greg Harbaugh (Diaz, Kidman). All photos: © A.M.P.A.S. Katherine Heigl was a presenter at the 2008 Academy Awards. In movie since 1992 (a small role in Craig Bolotin's That Night), 2008 Oscar presenter Katherine Heigl has never been nominated for an Academy Award. However, she has become a movie and television star following a lead role in Knocked Up and a recurring one in the TV hit Grey's Anatomy. The upcoming romantic comedy 27 Dresses (2008). Cast: Katherine Heigl. James Marsden. Edward Burns. Judy Greer. Cast: Katherine Heigl. Seth Rogen. Paul Rudd. Leslie Mann. Jason Segel. Jay Baruchel. Jonah Hill. 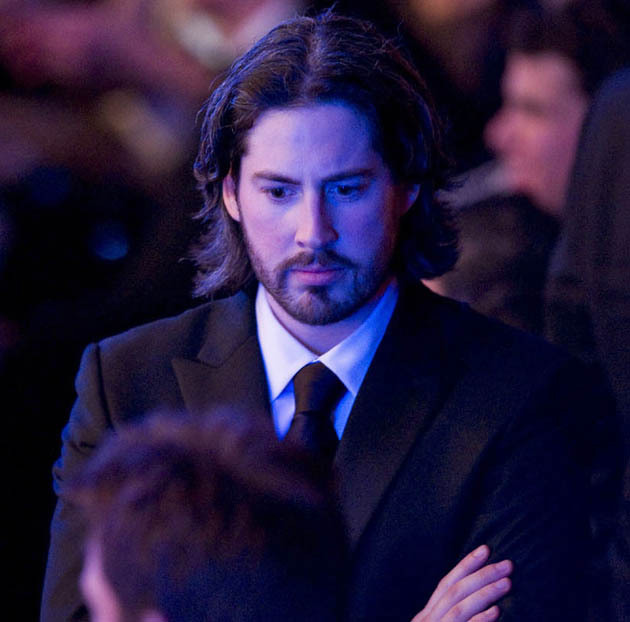 Martin Starr. Harold Ramis. Kristen Wiig. Cast: Jennifer Tilly. Katherine Heigl. Nick Stabile. Alexis Arquette. Gordon Michael Woolvett. Kathy Najimy. Voice: Brad Dourif. Katherine Heigl photo: Michael Yada / © A.M.P.A.S. 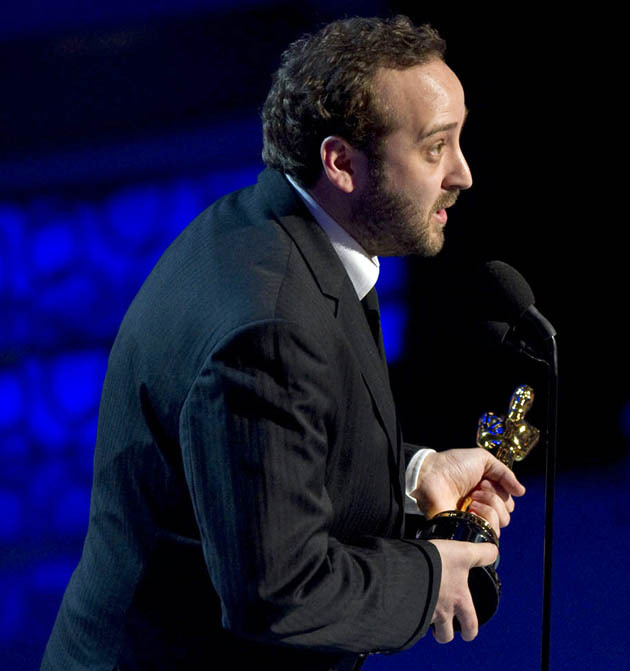 Nicolas Schmerkin: Best Animated Short Film 'Logorama' director. Martin Scorsese was last year's Best Director winner for the gangster drama The Departed, which also took home the Best Picture Oscar. In the cast: Leonardo DiCaprio, Matt Damon, Jack Nicholson, Vera Farmiga, Mark Wahlberg, and Martin Sheen. Photo: Michael Yada / © A.M.P.A.S. Photos: Matt Petit (Asano), Michael Yada (Hansard & Irglova, Ryan). All photos: © A.M.P.A.S. According to Oscar savants, experts, and know-it-alls everywhere, one TV-ratings point was lost per unfunny repartee at the 2008 Oscarcast. If so, the one between Steve Carell and Anne Hathaway was both long and unfunny enough to lose the show about 2 million viewers. Blame it on the dark-themed films, the (relatively speaking) little-known nominees (in the US), the – until just a week ago – threat that the show wouldn't go on because of the Writers Guild strike, network TV's recent strike-related viewership slump, the proliferation of film-award TV shows, the bad weather in Los Angeles, the Danish Film Critics' Bodil Awards held on the same day, the evening's fashion (Jennifer Garner, right), the iPhone, or the Oscarcast's reputation for being both long and ennui-inducing. Or blame it on the ignorant masses whose idea of quality filmmaking is Meet the Spartans. 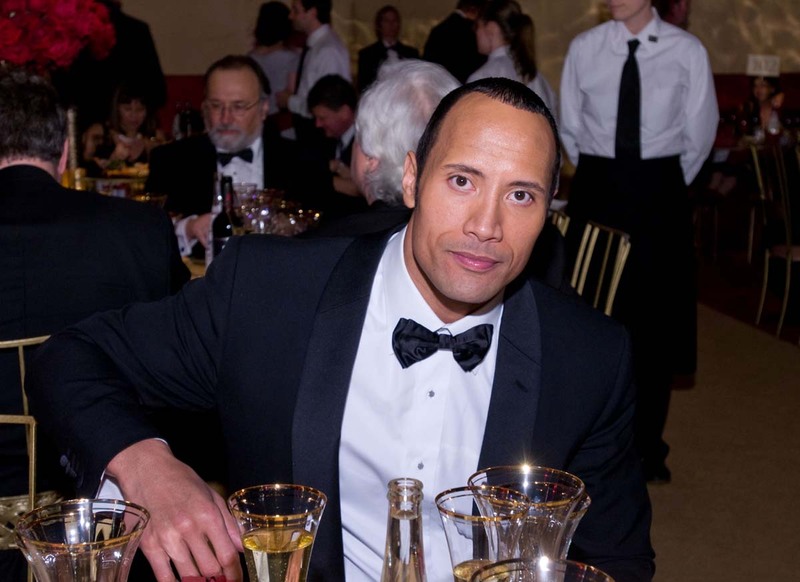 As per Nielsen Media Research, the 2008 Oscarcast hosted by Jon Stewart earned the lowest national household ratings ever (since 1953, when the show was first televised): 18.7. With 32 million viewers in the US, it was also the least watched show since this sort of tallying began in 1974. The previous Oscar viewership nadir, the 2003 ceremony (which began right after the US-led invasion of Iraq), had 33 million viewers. 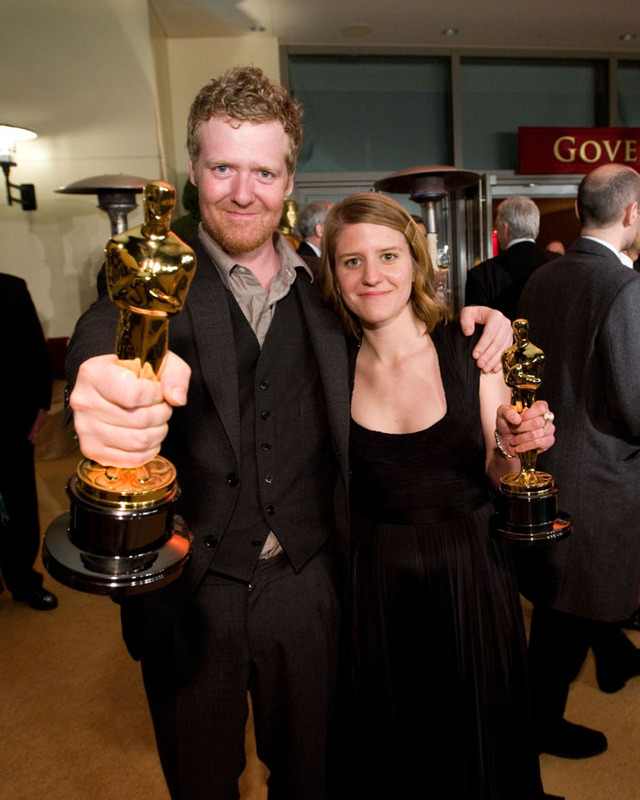 Now, considering that so many non-US personalities were nominated this year – all four acting winners were European – here's wondering if the Oscars, much like a number of Hollywood movies of late, fared better with TV audiences elsewhere. The most watched Oscar broadcast was in 1998, when the blockbuster Titanic won a record-tying 11 awards, including the best picture statuette. Approximately 55 million US viewers tuned in that year. This year, only one movie among the five best picture nominees, Jason Reitman's Juno, starring Ellen Page as a pregnant 15-year-old, has thus far crossed the US$100 million box office mark in the U.S. and Canada market. 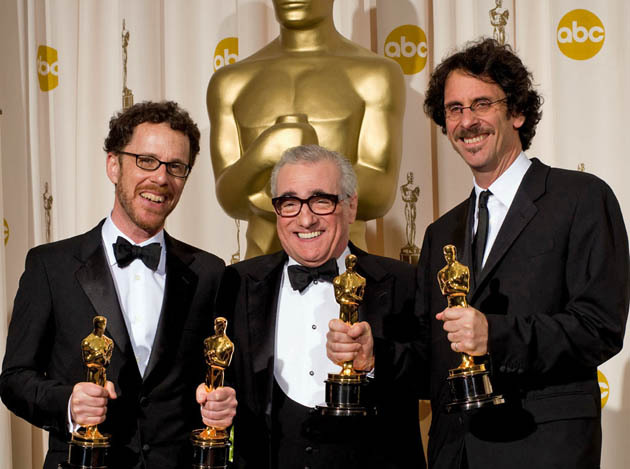 Martin Scorsese presented the Best Director Oscar to Joel and Ethan Coen. 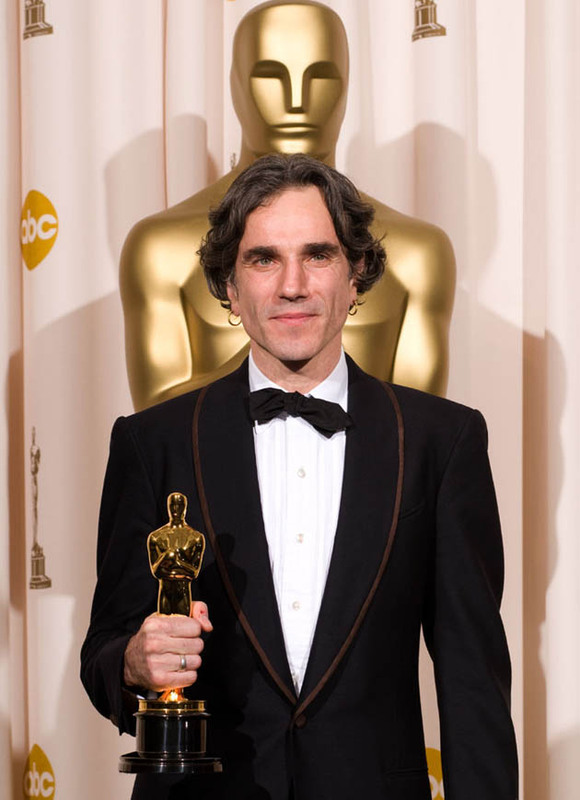 Other winners this year include Best Actress Marion Cotillard for La Vie en Rose and Best Actor Daniel Day-Lewis for There Will Be Blood. Photos: Darren Decker (Garner), Michael Yada (Carell). All photos: © A.M.P.A.S. Joachim Back Photo: Matt Petit / © A.M.P.A.S. Trevor Wood, Ben Morris, Bill Westenhofer, Michael Fink, Diablo Cody, and Dario Marianelli photos: Matt Petit / © A.M.P.A.S. Steve Carell, Brad Bird, and Anne Hathaway photo: Matt Petit / © A.M.P.A.S. Owen Wilson photo: Darren Decker / © A.M.P.A.S. Daniel Day-Lewis image: Matt Petit / © A.M.P.A.S. Joel and Ethan Coen, Martin Scorsese, Daniel Day-Lewis, Nicolas Schmerkin, Jason Reitman photos: Matt Pettit / © A.M.P.A.S.